Previous post: A book double-header! Sharon and I spent four solid hours analyzing, contemplating, and reconceiving the design on Sunday. We weren’t satisfied with the ruffles – Sharon thought they looked too heavy, and we both thought the diagonal yellow line was too prominent. Despite considerable fiddling, however, we weren’t able to come up with anything that we liked better. After about two hours we gave up and retired to the patio with cups of tea, to discuss the design problem in abstract. In addition, there were a bunch of opposing diagonal lines that lent a rather chaotic feel. Way too many design elements. We needed to simplify. But how? The easiest way to arrive at a harmonious whole would have been to eliminate the phoenix fabric entirely, and center the piece’s theme around the painted-warp patterning. This would have been easy and produced a lovely dress. However, I considered the phoenixes a non-negotiable element. I’d fallen in love with the cloth, and the title of the piece was Phoenix Rising, so I felt it should contain at least some phoenix cloth. So we started by considering the phoenix cloth. I wanted to keep the phoenix motifs whole, and I wanted a close fitting bodice – so the phoenixes would have to go into the skirt. I also really liked the current top, with the painted warp and the flame shapes. So the question became, “How can I integrate the painted warp with the phoenixes?” Not a trivial question, since they were two totally different design elements, with very different “feel”. 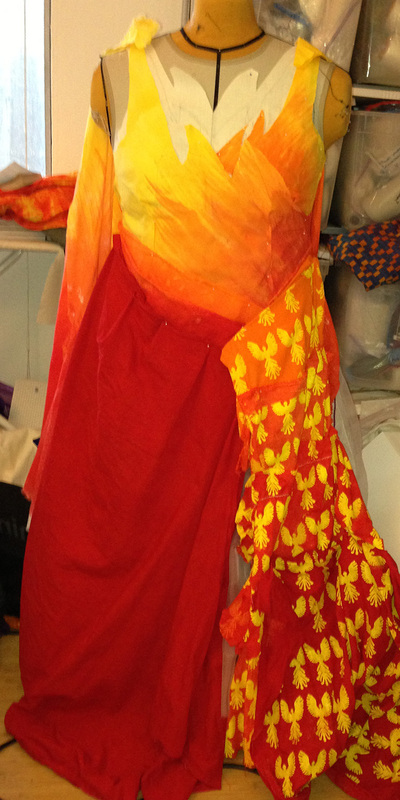 Here the pinned-together monstrosity is meant to be a single soft drape, with the background changing gradually from deep red to orange (matching the painted warp), with yellow phoenixes “flying up” into the bodice. I may make the phoenixes orange at the top, gradually fading them from view so they merge smoothly with the orange of the bodice. This would also solve the problem of what to do at the top, where the fabric needs to be cut on the bias to accommodate the diagonal. (Cutting on the bias would cut the phoenixes at the top, something I really want to avoid.) It would also let me gather or pleat the fabric a little bit. The entire skirt would be deep red, though I will probably do something to make the skirt more interesting than a plain red. Options include weaving it with scarlet warp and black weft, which would make it iridescent, or doing some subtle painted-warp striping in two shades of dark red. Or I could weave it in a slightly textured pattern, with the same color warp and weft, to add a little visual interest without making it too attention-grabbing. Here the shoulder drape would be of phoenix cloth, with yellow phoenixes on a background that shades gradually from golden yellow to deep red. The effect would be phoenixes flying up the skirt drape, disappearing into the fiery blouse, and reappearing on the other side. The skirt is entirely dark red fabric. Next step is to refine the muslin mockup somewhat – dyeing two more lengths of fabric to represent the drape. Then, if I still like the design, I’m going to do a second version in silk, to see how the design looks in a more fluid fabric. I’ll also start weaving samples of the deep red cloth. It will be a very fine, floaty fabric – 140/2 silk warp (35,000 yards per pound, about 1/3 the weight of sewing thread) and either 140/2 silk or a similar weight of reeled silk for weft. No clue yet about what pattern to weave into the cloth – that’s one of the things I’ll be designing. But no more muslin work this week – I flew in to Bellingham, Washington yesterday, and am spending a few days visiting with friends before going off to ANWG (the Pacific Northwest weavers’ conference). So this week will be mostly social, though I will probably work on some drafts for the skirt fabric, too. And I will work on integrating book blog posts into chapters. My only comment would be to remember your own advice about working in a series. Maybe each of those different design elements could become the focus of another one in the series of Phoenix-focused pieces. I can see a definite improvement in the focus of the piece as you continue. It is fascinating watching your progress, especially when I consider how very differently I work.